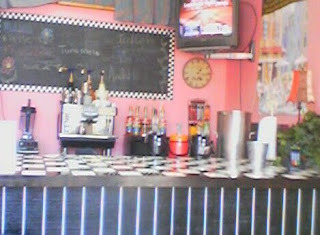 For lunch yesterday we stopped in downtown Mesa at the Jersey Girl Cafe. Friends have been telling me for months that I need to check the place out and they were right. The food is fresh, tasty and reasonably priced. Lunch for two was about $15.00 for 2 sandwiches with a side and and a pickle, a huge tropical fruit flavored iced tea with free refills and choice of a homemade cookie for dessert. The decor is adorable and there is a large map of New Jersey on the wall where you can put a push-pin in the city where you lived. I ordered a tuna melt on sourdough with a side of potato salad. The sandwich was perfectly grilled and loaded with cheddar. The red potato salad was perfect, with crunchy bits of celery and onion and free of all the weird spices most restaurants throw in to disguise the fact that their product is usually several days old. It's probably the best potato salad I've had in a long time. My friend Barb ordered the chicken salad sandwich and she was raving about it too. I'll have to try that next on our next visit. Thank you so much for the vacuum cleaner recommendation. I've ordered a Dyson and can hardly wait for it to get here!